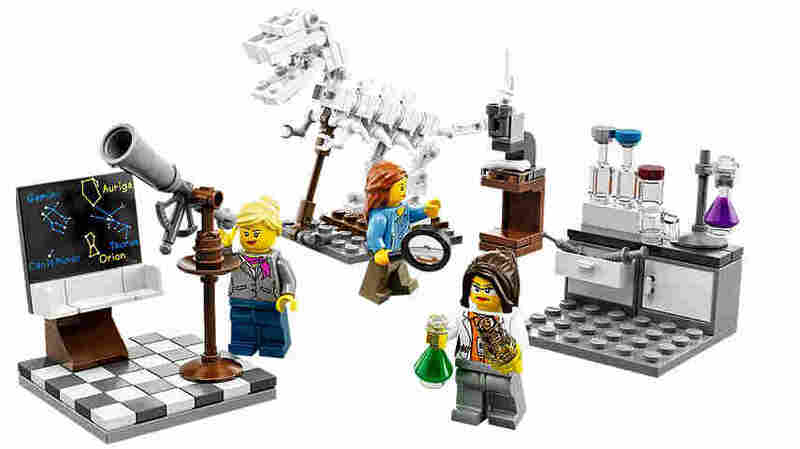 Lego Releases Female Scientists Set, May Appease 7-Year-Old Critic : The Two-Way Months after a girl took the company to task for its female toy figures, Lego has released the Research Institute, a play set created by a "real-life geophysicist, Ellen Kooijman," the company says. A product image shows the new Research Institute playset from Lego, which features women in roles as three scientists. In January, the company was criticized by a girl who said all its female characters were "boring." Months after a girl took the company to task for its female toy figures, Lego has released the Research Institute, a play set created by a "real-life geophysicist, Ellen Kooijman," the company says. The set will let kids take on the roles of paleontologist, astronomer and chemist, using three female figures. It might also satisfy some of the demands set forth earlier this year by Charlotte Benjamin, a 7-year-old who wrote a scathing letter to the company accusing its female characters of being boring. "I love Legos," Charlotte wrote. But, she continued, there aren't enough girls — and the ones the company has made just "sit at home, go to the beach, and shop," while the boy characters "saved people, had jobs, even swam with sharks!" The girl's letter attracted widespread attention — and within a week, Lego responded, saying "we have been very focused on including more female characters and themes that invite even more girls to build." The new research kit, which includes a telescope, a T-Rex model and a lab set, was selected by Lego Ideas, a program that lets customers submit their own suggestions for projects. In what could be a total coincidence, the company said it was reviewing the set for possible production just two days after Charlotte's letter began going viral. We spotted the new playset in a blog post over at io9 this weekend. You can read Kooijman's review of the product she helped design, in a blog post that ends with the line, "Cheers to science and good play!" The new Research Institute set costs about $20 — but it's currently out of stock, a look at the Lego online store shows. The set continues a streak of more female-centric releases from the toy company — a trend that led NPR's Neda Ullaby to ask last year, "Girls' Legos Are A Hit, But Why Do Girls Need Special Legos?" Back in 2011, Lego began a push to tailor more of its products to girls, introducing the Lego Friends series of toys. But a backlash ensued, complete with a petition posted on Change.org that attracted tens of thousands of signatures. It asked the company "to stop distinguishing between toys for girls and those for boys," as NPR's Tell Me More reported. It seems the complicated question of whether boys' and girls' Legos should be different — and how — persists. A look at the Lego online store's "Girls" category today finds that its recent releases include a horse stable, a play house, a shopping mall — and a "Model Catwalk."